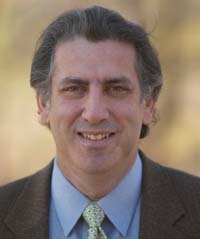 Joe Trippi (born 1956), a political consultant affiliated with the Democratic Party, is best known as campaign manager of Howard Dean's campaign for the U.S. presidential election, 2004. He has also worked on a number of other political campaigns, including presidential campaigns of Ted Kennedy, Walter Mondale, Gary Hart and Richard Gephardt. "For me, politics and high tech have always sprung from the same well - the balls-out desire for progress, the idea that the greatest force for political and social change in America has always been the ingenuity and creativity of its people," Trippi writes in his 2004 book, The Revolution Will Not Be Televised (p. 11). Raised in Los Angeles, Trippi dates his interest in politics to 1968, the year when he watched Bobby Kennedy on television give an inspiring speech immediately before his assassination. His first personal involvement in politics, however, began in college, when he was elected to the student council of San Jose State University and began working on local city council elections. He also dates his fascination with technology to his student days. "As it turned out, San Jose was one of the birthplaces of the coming computer age, and so everywhere I turned someone was doing something fascinating that I had to find out about. ... The first generation of geeks was everywhere, walking around Bay Area campuses, staring off into space, mumbling computer code, already beginning to plot their binary takeover, and I moved as easily in their world as I did in ... campaign headquarters," he writes in The Revolution Will Not Be Televised (pp. 11-12). In 1980, Trippi went to Iowa as a field worker in the unsuccessful presidential primary campaign of Massachusetts Senator Ted Kennedy. Iowa's caucus system, he writes, is "grassroots politics at its most basic level, a bunch of neighbors getting together to talk about their common interest - in this case politics - and, during a presidential campaign, to choose the candidate they prefer from the two major parties. ... The Iowa Caucuses are a participatory, social, bottom-up civic engagement - everything that politics has lost through its black-tar addiction to television advertising, and everything that the Internet offers again: a chance for people to not just vote, but to become involved again, to write the agenda, to contribute to the organization, to affect more than just the numbers. ... It's a nonscientific, arbitrary, messy, heartbreaking system. And it's absolutely vital to our democracy" (pp. 20-21). In 1981, Trippi worked on Los Angeles Mayor Tom Bradley's unsuccessful campaign for governor of California. In 1984, he worked on Walter Mondale's unsuccessful campaign for president of the United States. During the primary campaign, however, he was impressed by a campaign strategy of Mondale's rival for the Democratic nomination, Gary Hart. "A good political operative learns as much from his rivals as he does from his own campaign and as I watched Gary Hart, I was fascinated by his campaign," he writes. "Every other candidate ran around Iowa speaking to as many large crowds as he could fit in - the way politics had always been done. But Gary Hart would pop into a town and look for that one key person. His pebble. Then he'd drop the pebble into the water. And leave. Let that energy ripple out to the other folks in town. He described it as the politics of concentric circles - the idea of waves spreading out from a single stone into the water. He'd concentrate his considerable charm and intelligence on one or two key people and genuinely connect with them. ... I never forgot Hart's strategy. What had seemed counterintuitive at the time began to seem brilliant to me, especially for an insurgency campaign, the idea that you could spread a candidate or a cause or an issue like a virus - starting with a small, key group of people and letting them run wild for you" (p. 30). After the 1984 presidential campaign, Trippi went to work for Caddell, Doak & Shrum, a political advertising agency founded by pollster Pat Caddell. In 1987, he worked briefly on Hart's unsuccessful campaign for the Democratic presidential nomination and later helped develop advertising for congressman Richard Gephart in his also-unsuccessful presidential primary bid. He felt dissatisfied, however, with the "slick, diminishing power of television advertising. ... Even at its best, making TV spots can feel ultimately soulless. ... I worked on spots for more than twenty different Democratic campaigns. And while I agreed with most of the candidates whose ads I made, I didn't know what made them tick. Hell, I hadn't even met half of them. ... A television ad reaches voters passively. You just sit there and the box tells you what to think, or what you want - unlike the Internet, where you open a search engine or eBay or Amazon.com and tell the box what you want. And then, after you order the book, or bid on the baseball cards, the box acts you what you thought of the book and if you were happy with the auction. This is bottom-up, interactive communication. Television has a top-down, one-to-many structure, and it works by making an impression so that the next time you're in the grocery store and you walk past the Listerine, an image flashes in your mind of two actors so taken with each other's minty breath that they begin making out. It's no different with political advertising on TV: you sit there and the ad washes over you. ... If you make these short, reductive, cynical spots for a living, you begin to see the audience not as people organized into communities, with jobs and families and concerns, but as a series of effects you're trying to create, numbers to be moved, prejudices to be mined." (pp. 33, 35-36). In 1992, Trippi worked on Virginia Governor Douglas Wilder's abortive effort to seek the Democratic presidential nomination, but he was impressed by the effective insurgent campaign of California Governor Jerry Brown, who effectively used a toll-free 800 number to attract small donors. "At Brown campaign headquarters," he writes, "supporters and money were rolling in, even though Brown had announced he wouldn't take any donation larger than $100, one of those counter-intuitive ideas I filed away and would come back to years later. ... That 800 number became the key to Brown's surprising run - his message, his organization, his fund-raising all rolled into one media-savvy, interactive bundle. ... In the end, when all the other Democrats in a crowded field had dropped out, only Brown would still be standing, nudging the party to the left against the best campaigner of our generation, Bill Clinton, and with $100 donations on an 800 number, reminding people that this was their system, not the Democrats' or the Republicans' or the special interests'. ... Looking back, it's easy to see it as the first step in many that would lead to the Dean campaign, but it's amazing how primitive it was - like one of those old washing-machine sized computers, big, bulky, and not quite there yet ... but in hindsight, the big, messy beginnings of a revolution" (pp. 49-50). In March 2003, Trippi became the campaign manager in Howard Dean's long-shot campaign to win the Democratic nomination for the 2004 presidential election. As late as January 2003, he notes, "the Dean campaign was still squirrelled away in a cramped, 1,000-square-foot second-story office above the dark Vermont Pub and Brewery. There were six people - seven if you counted the governor - working for Dean for America, most of whom had been longtime aides in the governor's office. ... By January 2003, one year before the Iowa primary, while the other campaigns had built sophisticated political machines, raised war chests of millions of dollars, and compiled computerized lists of potential supporters in key states, the Dean campaign had none of these things, had raised only $315,000, and had spent two-thirds of it just remaining on life support. .... There was a computer in the Dean headquarters - and a relative of the governor's had set up an early web site - but it wasn't even turned on. They had gathered about 9,000 names of 'Friends of Howard,' people who had, at one time or another, told the governor that they might be interested in helping if he ever decided to seek higher office. ... But instead instead of being readily accessible for sorting on a computer database, these names, along with names of thousands of other potential supporters, were scrawled on business cards, contact sheets, and scraps of paper and stuffed in a few shoeboxes - not even one shoebox for each state. Dean was getting very little media coverage in those cold, dark Vermont days, other than those stories about how little chance he had. The first Dean stories all had headlines like 'The Invisible Man' and 'The Darkest Horse.' ... In most polls, his 'support' was less than the margin of error of the poll: 2 percent here, 1 percent there. When I arrived in January, Dean had been campaigning in Iowa by himself for months, and yet he was tied there with the Rev. Al Sharpton at 2 percent, badly trailing the 'serious candidates': Gephardt, Lieberman, Kerry, and Edwards" (pp. 77-79). The Dean campaign's greatest asset, Trippi says, was "the candidate's refreshing honesty and lack of political guile, and the sameness of the other candidates," which "all gave Dean the whiff of a true incumbent. The challenge was finding some way to fast-forward the usual campaign building and, at the same time, skip over the dismissive TV media and appeal directly to the American people. ... So right away we could see that our only hope was to decentralize the campaign, ease control away from the candidate and his handlers in Vermont (myself included), and let the momentum and the decision making come from the people - stop trying to control the river ... just open the flood gates and see where the current took us. ... Like someone whose entire life has been building to this point, I knew without looking what our only hope would be: the Internet. ... On my very first day in the Dean campaign headquarters, ... I offered up the closest thing I had to a strategy: 'We need to put a link to this web site, Meetup.com, on our campaign web site." He had noticed Meetup.com, he says, because although Dean was "dead last among the Democratic candidates in almost every other meaningful measurement," he actually had more supporters on Meetup.com - 432 - than any of the other candidates. "After we put Meetup on the web site, I checked back, and suddenly there were 2,700 people who wanted to meet up for Dean. The number had taken one of those exponential leaps - what would turn out to be the first of many. The second-highest candidate, Kerry, had only gone up to 330 names. ... And this burst didn't come from the campaign buying a TV spot or scheduling speeches - in fact, this wasn't the campaign at all. This was the people taking over. For months, Meetup.com would run its own parallel campaign, the number of people meeting up growing from that initial 432 to more than 190,000. Eventually, we'd even have to create our own, specialized version of Meetup - the GetLocal tools, which would grow to 170,000 people on its own." (pp. 79, 82-86). Joe Trippi, The Revolution Will Not Be Televised: Democracy, the Internet, and the Overthrow of Everything (Regan Books, 2004), ISBN 0060761555. Joe Trippi, "Trippi," Loose Democracy weblog, February 9, 2004. "Broadcast politics has failed the country miserably," Trippi declares. "The War, DMCA, Patriot Act, etc., were all passed without debate and without discussion in the mainstream media. The Dean campaign was ... about making a real change, fixing a system that's broken and corrupt. ... This was not a dot com crash. It was a dot com miracle. We started last January with almost no money and 436 known supporters. In Iowa, Dean was a 0. ... And then we ran straight into broadcast politics. Here's what happened: Al Gore endorsed us. Alarm bells went off in every news room and in every campaign. The alarm said: 'Kill Howard Dean right now. Because if we don't kill him right now, he's going to be the nominee.' The press corps said we have to put him through the wringer that every nominee goes through, we have to hammer him. ... It wasn't a dot com crash, it was a dot-com miracle being shot down. Now they say it failed. Why do they want it to fail? What's so scary about the American people actually getting involved in their democracy? ... You have done something amazing. The Internet is the most powerful tool ever put into the hands of the average American." Terry Gross, "Interview with Joe Trippi," Fresh Air, National Public Radio, July 6, 2004. Trippi describes how his own experiences on the web drove his interest in "community building on the Internet ... The American people now really have a tool that can let them connect with each other in really dynamic and energetic ways. ... Meetup.com is a Web site that allows people to come together, discuss their hobbies, different interests, and then meet each other offline. And we had looked at that site and realized that we had to decentralize the campaign; we had to give people a place to go meet. We didn't have campaign offices in 50 states. And so we got people to sign up at Meetup.com, sign up as Dean supporters, and then meet on the first Wednesday of every month. We started out with really a couple thousand people, and by the end of the campaign, we had 190,000 Americans meeting together in their own communities on the first Wednesday of every month. ... I think it was one of the breakthroughs of the Internet this year is that we now - MoveOn.org and the Dean campaign in particular prove that you can use the Internet to get thousands and thousands of people to do things, not on the Internet, but in their own communities." Joe Trippi, "The Revolution Will Not Be Televised," MSNBC, July 5, 2004, includes an excerpt from his book: "When Howard Dean's bid for the presidency finally did its crash-and-burn (not in an Iowa corn field, as it turned out, but onstage in an Iowa ballroom), a cynical, middle-aged campaign consultant who thought he'd seen it all, who thought he knew it all, an old pro who'd made it his life's work to win elections at all costs, learned the most profound and unexpected lesson of his life. This time, it wasn't about the candidate at all. It was about the people. This was never about him. It was about them. An amazing thing happened in the presidential contest of 2004: For the first time in my life, maybe the first time in history, a candidate lost but his campaign won." The Dean campaign, he says, was "the opening salvo in a revolution, the sound of hundreds of thousands of Americans turning off their televisions and embracing the only form of technology that has allowed them to be involved again, to gain control of a process that alienated them decades ago. In the coming weeks and months and years, these hundreds of thousands will be followed by millions, and this revolution will not be satisfied with overthrowing a corrupt and unresponsive political system. It won't stop at remaking politics. And it won't pay attention to national borders. ... It's the story of people standing up and making themselves heard. It's the story of how to engage those Americans in a real dialogue, how to reach them where they live, how to stop selling to them and start listening to them, how to make better use of the most revolutionary idea to come along since the first man learned to light a fire. No, I'm not talking about the Internet. Or computers. Or telecommunications. I'm talking about democracy." Bill Simon, "Turning Point," U.S. News & World Report, July 19, 2004, offers a detailed post-mortem showing how John Kerry's campaign, using traditional campaign tactics, out-strategized and beat the Dean campaign in Iowa. weblog of Change for America.com. David Skinner, "Howard's Web : The Dean camp's Internet impresario," Weekly Standard, January 19, 2004. Tom Dunkel, On the Threshold. Down but not out, ex-Dean campaign manager Joe Trippi builds on ideas for a new America with a sturdy populist foundation, Baltimore Sun, March 10, 2004: "Trippi and friends intend to create a more left-leaning, 'grassroots version' of the Democratic Leadership Council, the quasi-think tank that's long been aligned with party centrists such as Bill Clinton and Joe Lieberman. No campaign manager (certainly no losing campaign manager) has ever left the political sidelines in order to play a prominent role in launching a reform movement. But the Change for America initiative - amorphous though it may be at this stage - isn't entirely out of character for Trippi." Article contains some narrative-style biographical information, as well. Kevin Bogardus, "Washington lobbyists develop strategy for Nigerian politicians", The Hill, May 30, 2007. This page was last edited on 18 June 2007, at 19:52.